This wouldn’t be so damn annoying if it weren’t so damn common. Great Lakes beach-goers are being warned to avoid … muck? No. E. coli bacteria? No, not this time. Syringes? Yes, syringes, from Milwaukee. July 25? Today is Aug. 12. Thanks for the quick notice. Awesome. This isn’t the first time I’ve come across such a warning. What? Who was investigating back then? The DEQ. More than four years ago. 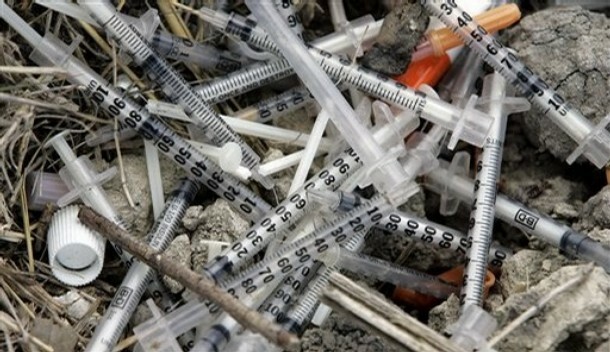 “Improper disposal of multiple syringes may be related to illegal management of medical waste by a doctor or veterinarian’s office, a clinic, or a tattoo facility,” the release said. Milwaukee also sent us some syringes in 2008, notes the Lansing State Journal. There’s an even longer history of syringes on Lake Michigan shores and I’m old enough to remember it, unfortunately. It happened in the late summer and fall of 1988. It caused a public uproar and the news media chomped on it. The furor led to a federal “Medical Waste Tracking Act” which has since expired. If you live long enough you’ll see syringes on Lake Michigan beaches four or five times, it appears. What I want to know is how any syringes got mixed into a combined sewer overflow. Did someone flush them down a commode, one by one? Down a sink? Did someone throw them into a storm sewer? I can see someone throwing them into the trash, as bad as that would be. But it would seem to take more work to dispose of them into water, or in a place that would lead to water, especially at the numbers they’re talking about.